Our ultimate goal is to create a safe and enjoyable shopping experience for every customer. 1. To start using our service you need to register. 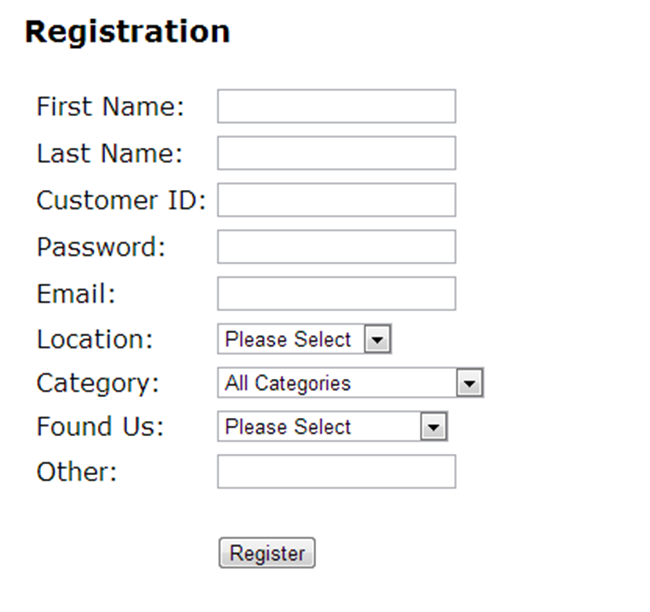 Fill out required fields First Name, Last Name, Customer ID, Password, Email address, Location. Other fields are optional. If registration is successful you will receive an instant email with your activation information. Please keep it for your records. Follow the activation link and go to the Log In page to access your account. 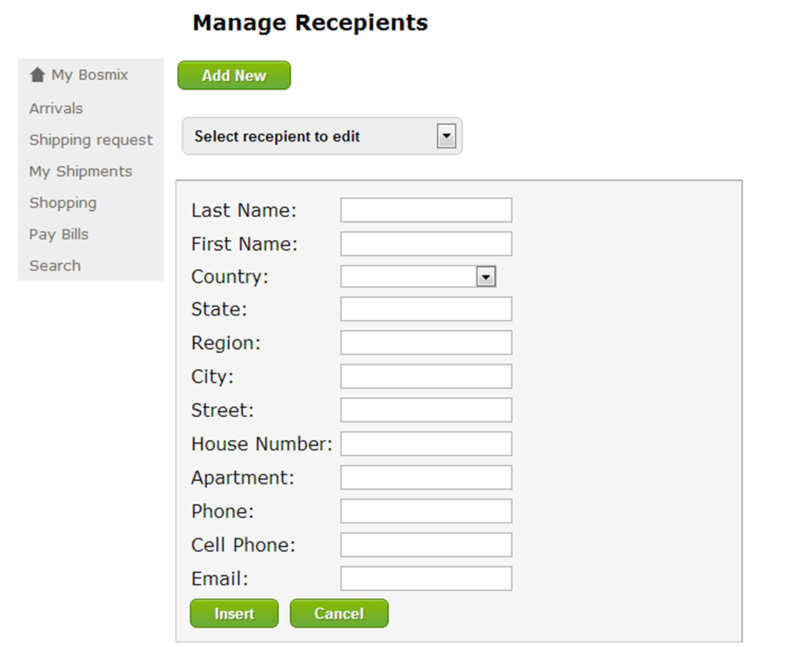 From here you can add a recipient by clicking Add/Edit Recipient. From here you can click Add New and fill out the recipient information. Click Insert when you are done. Go back to My Bosmix to view changes. 3. Place an order at any U.S. online store. NOTE: Shipping address and Billing addresses are different. You can only use our company's address as Shipping Address. There is no need to fill anything out after you have placed an order with the store. When item is received at the warehouse it will appear in your arrivals. You can add or edit a note. 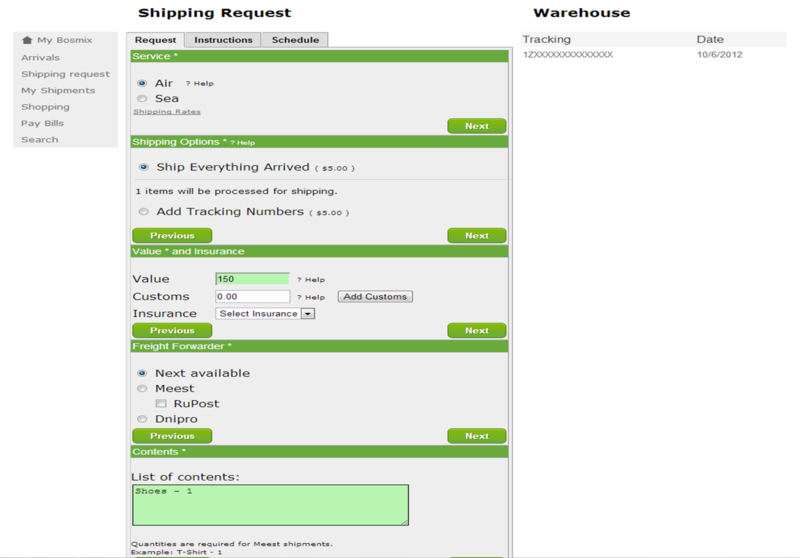 Status will show when this tracking number will be shipped from our warehouse. 5. Fill out a Shipping Request. When all of your items arrive fill out shipping request form to create a package that will be shipped to your destination. Select Air or Sea Service. You can ship everything arrived or select items to be shipped. * Please note items larger than 18x18x24 inches will be shipped separately. * Cost of processing will vary if you select "Select items" option. Fill out total value of all items to be shipped. Other field are not required. After email confirmation your request should be processed in up to 48 hours. After package is processed you will receive a bill. Click Pay Now to process a payment. 3 Go to Shopping section. 4. Click Place Order Now and fill out the form. 5. Add credit or pay the bill when it's ready. Add Credit for the total amount of the order + 5% Commission or wait for the bill. It may take up to 24 hrs for your order to be processed. Orders are processed after payment. Bosmix LLC is a Limited Liability Company registered in the state of Massachusetts and its main goal is to provide shipping, shopping and assistance services to customers in the United States and Eastern Europe. One of our unique functions is to provide full services to clients over the Internet. Many prospective customers live in the areas where they are not able to personally reach another agent or physically deliver their parcels to agent's location. With a convenience of their home, anybody from continental United States, Europe and other International locations is able to have a full access to our services. We also provide services for clients who need assistance to purchase products at online auctions and stores or simply need help with shipping products to their destinations in any CIS countries. Bosmix has been in the shipping industry since 1992 and in 2005 we started online shopping service. Many years of experience give us a chance to provide best service. We strive in the market by providing safe and pleasant shopping experience. You can use "make payment" button that will transfer to PayPal. Upon receiving of your funds we will credit your Bosmix account for the equivalent amount of your deposit or any other deposits. 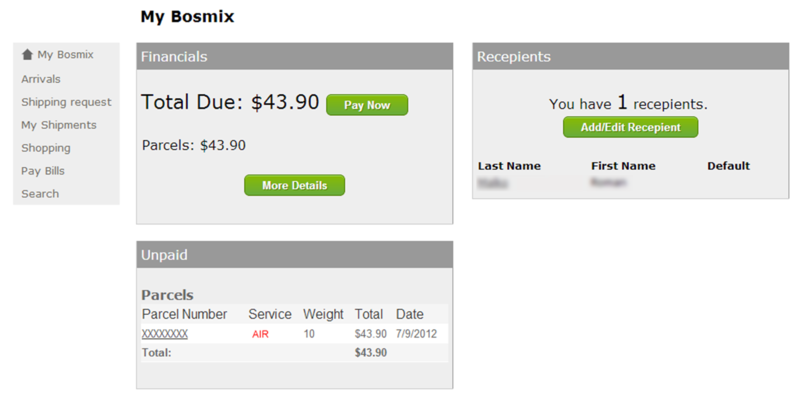 You will receive instant confirmation from PayPal and payment will be credits to your Bosmix account in up to 24 hours. Note: Payments over PayPal are subject to additional 3.9% + $0.30 PayPal transaction fee charge. We accept PayPal, Visa, MasterCard, American Express, bank wire transfers. 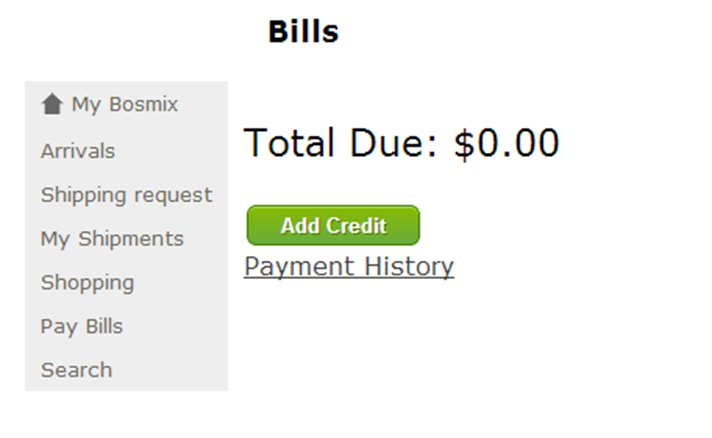 I submitted payment, but why is my status still says unpaid? Payments are not updated instantly. Please check if you have received PayPal confirmation email and allow up to 24 hours for your payment to be processed. I didn't pay for my shipment, will it be shipped? No, we do not ship unpaid packages. Please submit your payment before 9 AM shipping day. How do I know that my products have been delivered to Bosmix warehouse? Received items will appear under your account's Arrivals section. How can I ship items from Bosmix warehouse to my destination? You need to fill out Shipping Request form your account. Please see the instructions in the Getting Started section above and on the form itself. When do I need to submit a Shipping Request? When all of the expected items are at the warehouse in the Arrivals section of your account and you are ready to make a shipment to your destination. Is there anything that I need to do before my items arrive to warehouse? No, there is nothing you need to do. You will be able to see in the arrivals section that you have a tracking or item at the warehouse when it will be delivered to Bosmix. How will the price be calculated for my shipment? Price will be calculated according to your shipment's weight multiplied by your country's rate, plus the delivery charge. Additionally you will pay for processing and you may add services like insurance, heavy duty box and other services. The total will appear on your account. Note: Payments over PayPal are subject to additional 3.9% + $0.30 PayPal transaction fee charge. What are the shipping limits? We ship a range of products and able to ship freight. Please contact us if you have an irregular shipments. Regular limits can be viewed here. How do I know that my package was shipped from Bosmix? Under package detail information and in My Shipment section you can check the Ship Date. This is the date when your package is expected to be shipped or was shipped from Bosmix warehouse. Please note that unpaid shipments will be held at the warehouse. Is there any prohibited items? Yes complete list of prohibited items is here. What is the best way to consolidate packages? On the Shipping Request select Ship Everything Arrived option and click Let Bosmix set my customs fee checkbox. When is my package going to be processed after the Shipping Request? If your Shipping Request was submitted according to schchedule, your package will be processed before shipping time or approximately within 48 hours. Can I use Bosmix address as my Billing Address? No, you can not use our address as your Billing Address. Your U.S. address can only be used as a Shipping Address. For Billing Address you have to provide your address. Who is responsible in case of a defaulted transaction? We do not carry any responsibilities on any transaction authorized by customers. It is customer's responsibility to read the description of products, shipping cost, validity of the seller, his integrity, quality and number of feedbacks or any other terms and conditions associated with a purchase. Therefore we assume that a product or payment link we have received is carefully reviewed and validated by a customer and we are only responsible for receiving or payment part of a transaction with further shipping and processing. However, we provide assistance to our customers in order to resolve different discrepancies, but we do not guarantee a positive end result. What to do if part of my order is missing? If any items are missing from orders delivered to the customers destination please check with the store the order was placed from first. There are many cases that a part of your order was on backorder, out of stock or unavailable at the moment a order was placed. Also packages are delivered to our warehouse in a half open boxes, smashed or tempered and there is a chance that part of a order is lost along the way to the Bosmix warehouse. Due to this circumstances Bosmix cannot be held responsible for any missing items delivered to a customer and there going to be no reinmbursement issued by Bosmix for missing items. However we will help to resolve any issues related to the situation. I received certain items that do not belong to me. What should I do? We do our best not to misplace any items and appropriately send them to their owners, however for a number of reasons, very rarely, there might be certain unidentified parcels and items sent to a wrong recipient. We ask our customers to immediately notify us about any items that do not belong to their orders and have been delivered to them by mistake. In order to avoid this problem, please make sure you have indicated correctly your name or Customer ID during checkout process. I am missing certain items from my order. What should I do? If this happened to you, please visit our Lost & Found section. We will constantly update that section if there are any unidentified items. If you found items that belong to you, you must immediately claim these, by contacting us. Can I use Bosmix LLC company's address for my other purposes? Only registered customers are allowed to use our business Shipping Address. Registration of our business address on eBay is prohibited. You can add our address as your shipping address only. Any violator of this rule will be reported to the eBay authorities and as a result your account will be suspended immediately. We reserve the right to terminate any account without previous notification. Feel free to contact us if your question(s) have not been answered. You may also e-mail us with any comments, inquiries or suggestions in order to help us to improve our services. We appreciate your feedback and will take into account any of your comments and suggestions.